The new Oasis Dig Out Your Soul album cover is a bit of a curiosity. Designed by Julian House, it's a collage of various items which when put together give a startling effect... of saying nothing... just like Oasis songs really.... or does it? In this Youtube video Noel Gallagher suggests there is a kind of 'religious armageddon theory' 'going on.... can you dig it? Top Left Corner: New Oasis logo, a single orange Butterfly (Monarch? ), Clouds & Blue Sky, Dirt Hill with a grave yard of crosses and headstones beneath it. Centre: Dig Out Your Soul Title. A drum with a hand beating it with a large drum stick with a red knob. A mushroom cloud is erupting from the drum. A pair of large hands surround the drum. Bottom Left Corner: Below the phonograph are is a pair of dummies and below them is an astronaut with an open visor showing the face of a man. Attached to his chest is something orange ? with an open hand protruding. To his right is a newspaper with the headline "Come In, Come Out!" (chorus line from Shock of the Lightning). To the right of the newspaper is a line of 7 or 8 men dressed in some kind of white robes. In the gaps is the grass from the graveyard. above the paper is a soldier pointing at the hand. He has a gun on his shoulder. In between the hand and the phonograph appears to be an obscured light bulb on a stick. Bottom Right Corner: To the right of the white robed men is an apple with a few bites taken out. To its right is a line of 4 people in black robes. One of them appears to have a cane. Below them is more people in white robes, this time with books in their hands. Under the apple is red piece of material which could be a shawl or a statue of some kind as there is an arm holding some kind of ornamental sword. It has a price tag of 125 pound. Above the black robes appears to a shoulder with an arm half stretched out. The face is missing. To the right of this is a picture of what could be Mary (the supposed virgin mother of Jesus Christ). She has a price tag of 99 pound and is probably part of the red statue. To her right is a Calvary of red soldiers raising a dust storm. Above this a blue rimmed clock, similar to the one used in Be Here Now. Beneath the lead horse of the Calvary is a pile of books, a mushroom and an eyeball. The rest if the corner is filled with a grass landscape darker than the cemetery side. 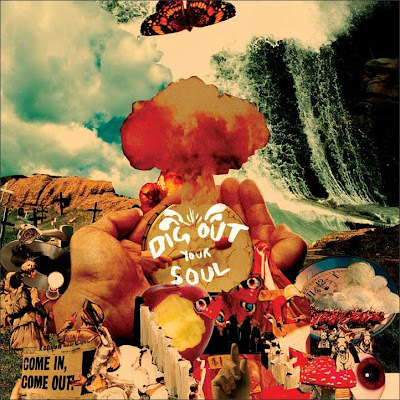 The inside of the Dig Out Your Soul CD leaflet has three one page collages and a two page collage of various images including guns, planets, more phonographs, random people, soldiers, amplifiers, flames and butterflies.